Allergy, Asthma, and Sinus of NOVA (Stone Ridge) - Book Appointment Online! 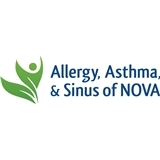 Allergy, Asthma, and Sinus of NOVA is a full service allergy care provider with a focus on providing relief to adult and pediatric patients for their allergy and asthma conditions. Dr. Adhuna Mathuria has been practicing in Northern Virginia for several years and is now located in Aldie, VA, across from StoneSprings Hospital Center.